This post was meant to be about breakfast. But Oh My Goodness have I been sidetracked! I love my breakfast, and that love has grown even more since having kids. You can read about it here, here and here. There’s something special about getting up before everyone else so I can savour my bowl of muesli (in summer) or porridge (in winter) in the peaceful early light. That morning space before the kids rise has become so important to me that it’s seen my alarm creep further and further forward over the last 3 years. I told her about my blog and my pre-Tamworth life as a brand ambassador for delicious goods and she generously sent me home with two bags of her “delicious nutritious”, paleo-inspired, health promoting muesli, one of them being Primal Cheeky Choc. What? Yup, that’s right. 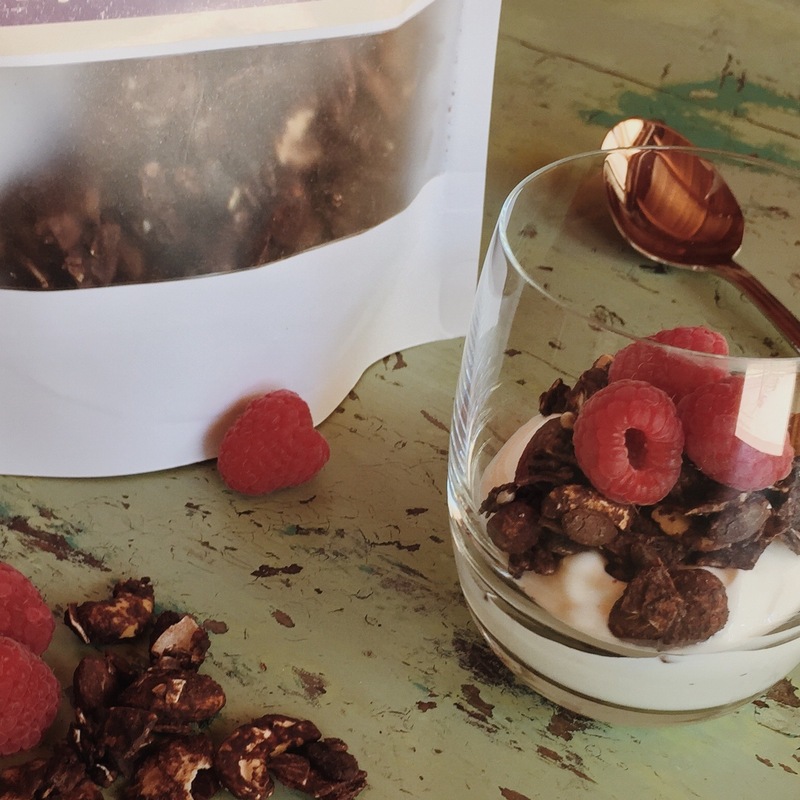 Chocolate granola. I didn’t think it would be my thing. But I was so wrong. The other product she shared with me, Primal Granola, is a more traditional breakfast but no less delicious. Muesli and porridge is a weekend treat for me and I love a fruit-free, granola style muesli topped with yoghurt and berries. Packed full of cashews and almonds, Rosy Cheeks’ Primal Granola has a great crunch and texture and delicious hints of coconut oil and maple syrup. I’ve been blessed with relatively good health so far, so I’m all about flavour, but Rosy Cheeks was inspired by Katie’s own health journey, after battling poorly controlled Type 1 diabetes and asthma. You can read about this journey on the Rosy Cheeks website, but in a nutshell Katie cut out gluten, dairy, processed food and refined sugars. She also cut back on carbs. Essentially Katie adopted a paleo diet, raved about the health benefits and created her delicious Rosy Cheeks range to ensure she could eat delicious, wholesome food, even on busy days. If you’re after health benefits, read more on Katie’s website and buy Rosie Cheeks. If you’re after flavour, take my word for it and buy Rosie Cheeks – visit the website for stockists or to buy direct. Now excuse me, I need to get to bed early so I can enjoy my breakfast tomorrow.